Sarah and Chad’s Greenville SC wedding was the perfect mix of them: bright and vibrant, caring and attuned to others, fun yet serious. Sarah and her bridesmaids danced in the bridal suite to her wedding day playlist while Chad adjusted his pinstripe suit and visited with family and friends. She was a pop of color with her red lipstick, giving air-kisses to all, and he listened closely to the marriage advice given by his 10 year old soon-to-be nephew. During their wedding ceremony, they served their friends and family communion, symbolizing Jesus’ sacrifice and service to us. He beamed at her after they were pronounced husband and wife, and she held him as they swayed to music only they heard. It was such a pleasure to get to know this couple, who, like my own husband and I, took their time in life finding one another…and their love and their connection is made all the more sweet because of the wait. Introducing Sarah + Chad, Just Married! Sarah’s dress from Bravura Bridal Salon was the perfect amounts of sparkle and lace. It was beautiful to photograph, and I just love this verse that’s engraved on the beams of their church. All of the ladies’ wedding day jewelry was custom designed. I’m a girl who loves a bit of sparkle, and these iridescent colors were PERFECT with all of the color that Sarah chose for her bridesmaids’ dresses. Barrett’s Flowers in Taylors SC created bouquets and boutonnieres that were full of sunshine and bright colors. I loved them! Sarah also incorporated more sweet memories of her Grandmother into her bouquet, but having Barrett’s tuck her Grandmother’s sparkly earrings into the flowers. “Getting Ready” photos have become one of my favorite times to be artistic during the wedding day. I love the way the light and shadows highlight the anticipation and energy as a woman transforms into a bride It’s a beautiful thing to capture. So this image may not be technically “perfect,” but I love it so much anyway. THIS is Sarah. She is confident and joyous, and she was READY to get married!! A little hallway dancing with her sweet flower girl and ring bearer. How cute are they?? Sarah knew exactly what she wanted when it came to her bridesmaids’ dresses: COLOR! This group of ladies was so fun and vibrant, and their dresses and flowers were the perfect fit. I cannot get over how beautifully their colors pop on camera! I love that Sarah was bold and unapologetic in her choices for their wedding. Taking design risks pays off big time! Now let’s be clear: the bold design and fashion sense doesn’t end with the girls! Chad and his groomsmen were super sharp in their gray suits and purple accents, and I seriously love Chad’s pinstripes and pops of red. Chad and some of his Groomsmen. My favorite is totally the middle image of nephew Jackson, who was very serious when I asked if he had any marriage advice for Chad. I would love to know what was being said here! Chad and his beautiful Moms. I love these looks of pride on their faces. Sweet, sweet, sweet Mama’s love. When Sarah was describing Chad to me, she said that she mosts loves his “patience, kindness, and thoughtfulness and strong sense of caring for those around him.” I love how these portraits reflect that peace abut him. I always ask my second photographer to go on into the sanctuary to capture the bride and her dad coming into the church, and that’s because *I* want to stick around for those final sweet moments between the bride and her dad. Sarah grew up in the Lutheran Church of Our Savior, and her parents also got married here! I loved the beautiful architecture and bold stained glass windows. Another of my favorite times on a couple’s wedding is what I call “Glow Time.” If a couple doesn’t do a First Look before their ceremony, those few minutes after they walk up the aisle are the FIRST time of the day that they are together without being in front of the whole church. These moments are when they can get lost in their own little world and let it sink in that they’re actually, finally married! I ask all of my couples to carve out a few minutes just for them to celebrate in their own way. The next few images are from Sarah and Chad’s Glow Time, and I just love how in tune to each other they are. Although every couple celebrates their Glow Time a little differently, it’s nearly universal for them to take a peek at their hands and new bling! Another hallmark of my approach to weddings is capturing “real moments and true emotions.” I will always, always get that smiling-at-the-camera Christmas card shot, but I love to give folks a space to laugh and giggle and snuggle in ways that are fun and relaxed. 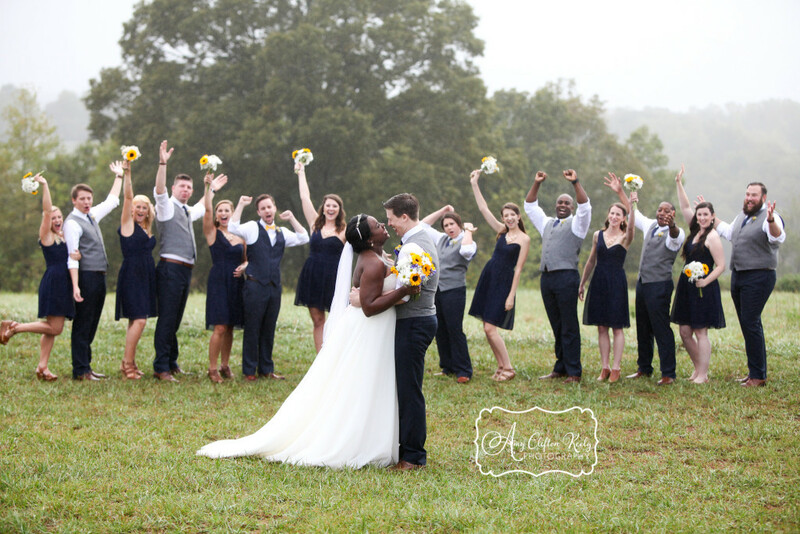 This shot of Sarah and Chad’s wedding party is such a fun moment! These colors and sweet family/friends are just gorgeous!! I crack up every time I see this photo. 🙂 I love all the variety of expressions in the background!! It warms my heart to see the way that in-love couples look at each other. I always have a “super-favorite” from every wedding, I think this is it from Sarah and Chad’s! Sarah and Chad’s reception was at Thornblade Country Club, and the ballroom was filled with so many loved ones, many who had traveled long distances to help celebrate. The Boomers from East Coast Entertainment kept the dance floor hopping for this Greenville SC wedding reception. Live bands are so fun! Paul Hoke from Heirloom Entertainment was the MC for the evening, and he brought several special touches that I just loved. One was special introductions as each of the wedding party were introduced. It was neat for guests to get to know more about these important members of the wedding day. Another was retelling Sarah and Chad’s love story, seen below. My favorite part of the reception, something that Heirloom Entertainment arranged, was for Sarah and Chad to have a “last Last Dance.” After the band played their final song, Megan from Thornblade guided the guests downstairs to line up for the rose petal exit. Sarah and Chad (and of course me and my camera) stayed in the ballroom so they could have one final dance on their wedding day…a few minutes alone in a day that is hectic and hurried yet all about them…some time to reflect on their day, in their reception space, and soak in the last moments of this incredible day that was filled with amazing moments. Sarah and Chad, I am so glad to know you through your wedding. Watching you love each other and love your friends and family so well was a beautiful thing. I wish you a lifetime of love and joy together. Remember friends, it’s awesome when you leave a comment below to “show us some love! !” You can also share this post to Facebook by clicking the “like” button below, and you can pin any image to Pinterest by hovering over it and clicking “Pin It.” Thanks y’all! Emily is a Furman grad, and she had always dreamed of having her bridal portraits photographed on the university’s beautiful campus. 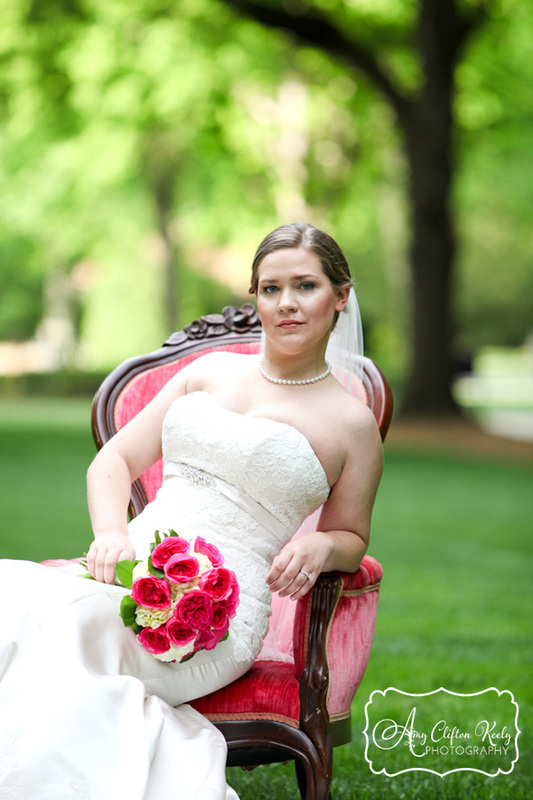 I tell you, I don’t think it’s possible for me to get tired of shooting portraits at Furman! There are beautiful locations and gorgeous light every where you turn. Having a lovely bride, an elegant gown from Carolina Bride and Groom, and a sweetly Southern bouquet from Twigs sure doesn’t hurt either! Emily was married last Saturday, so I can FINALLY show off her bridal portraits. I hope you enjoy! This is the shot that Emily chose for her portrait to display at her and Andrew’s wedding reception–simply beautiful! Emily is one of the happiest, most gracious and laid-back people I’ve met…but this girl can ROCK the serious sassy-face! Furman University’s Rose Garden has the prettiest gazebo–I love it! Such a cute and happy portrait! A few more of my favorites…a happy face, and several more of her killer sassy-face! If you haven’t already, click here or at the bottom of the page to “like” Amy Clifton Keely Photography on facebook so you can be the first to see a Sneak Peek of Emily and Andrew’s wedding photos! And as always, it feels great when you leave a comment to show us some love! Many congrats to the newlyweds!! Introducing Amy Clifton Keely Photography | Welcome to the New Site! I am so incredibly excited to announce the official launch of the new Amy Clifton Keely Photography–a new name, a new logo, a new website, a re-newed sense of joy and excitement for photographing your moments! In the past year+ I have married my sweet Mr. K and gotten myself a new name…so my photography business needed to follow! While I am still that same girl portrayed in my “old” website, I have a new perspective on life as a bride and a wife. I wanted this logo, this website, this BRAND to match who I am now, so I welcome you to Amy Clifton Keely Photography! I hope that you will take the time to explore all the new galleries, the testimonials, the “About” pages of my website. I hope that you will “like” me on facebook–you can click the facebook button at the bottom of any webpage to like my business fb page, and you can “like” any individual blog post as well to share it on your wall. Thank you for your love and support of me, of the Keelys, and of my adventures in photography. I am grateful. My husband is a happy guy. My favorite photos of us show us laughing together. He makes me happy, and he just has this way about him that makes everyone feel comfortable. On our wedding day, however, he had this different smile, this different glow of happiness. It was so cute, and I even commented to him after our “First Look” that I’d never seen him so smiley! This photo of Rich and Michelle reminds me of that look on Tony’s face–pure, unedited joy. Always–ALWAYS–when I am behind the camera, my most important goal is to capture “you” as you really are and to preserve so much emotion that you feel it all over again when you view your photos. Again, WELCOME and THANK YOU!